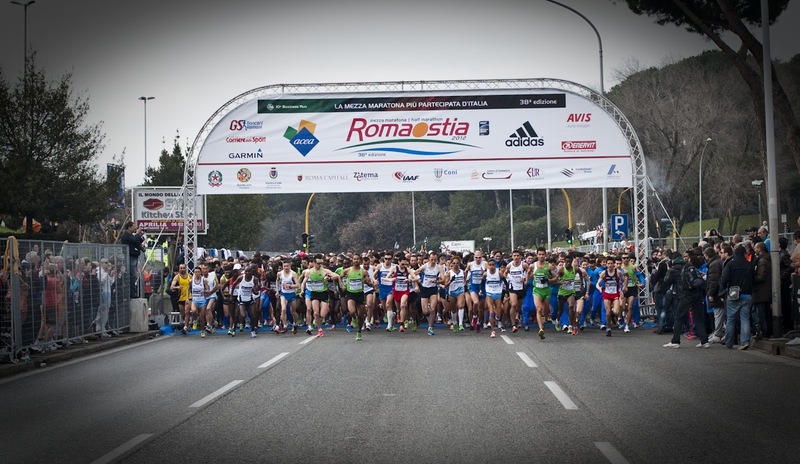 This morning it was the right day near Rome for this amazing italian halfmarathon with more than 13000 people from the center of city to the sea. A very fast course modified last year to cut 3km always with strong wind gave athletes the chance to make good times and also a temperature around 11-12°C at the start has helped all the athletes. Few meters after the start and it was clear everybody today must speak with Philemon Limo to catch the victory.This guy started to push very hard going through 5k in 13'36" and 27'34" at 10k.Splits for a WR for Kimeli Limo but too early in the race. "Philemon pushed too strong at the beginning:5'20 at 2k and 8'05 at 3k even if a little bit downhill,tell us how fast was his pace" so speaks his manager after the race "His pace at 10k it is probably his ever best time on 10k never run;if he could run around 13'50 at 5k and 27'50 at 10k,he will probably be able to run around 59'or under." An average pace of 2'45 per km till 15k gave him the opportunity to make something excellet but,in the last 5k he became tired and going a little slow,losing on the street everything good done in the first half of the race. He has finished in 59'32" realizing the second season-time on the distance.It must be underlined all the podium under 60' going into the fast 5 times of the season and firt six under 61'...really and incredible edition! !Philemon Limo run the fourth fastest time on italian soil:bettere than him only two good athletes:mr Paul Tergat and mr Moses Mosop..not anyone!!! Some words about italian Stefano LaRosa at the first halfmarathon in his career able to run a bit over 62'..day after day this guy is very promising and can give us satisfaction in Europe!! Women race was announced as the race of Florence Kiplagat and she did a magnificent job.Yesterday she declared in press-conference the idea to run under 68' but,honestly,impossible to believe when u have won Berlin in 2h19'! !This girl is incredible and had an amazing race never be worried by other girls:she run all race at pace of 3'10 per km..what can we tell her?? This result is the third fastest time ever run:only behind Mary Keitany and Lornah Kiplagat in the all-time lists!! The podium is completed by other two africans under 68'.the fourth place of italian Valeria Straneo in 67'46 and the fifth of other italian Anna Incerti has completely write as new the italian lists of halfmarathon:olympics is coming and italy in marathon-women will have surely an interesting team..